Camping with the kids takes a lot of effort. But if you plan it well enough, everyone ends up happy. Check out the 5 best camping activities with the family. The majority of parents agree that it’s important for kids to spend time outside, but it can be hard to find activities that get them excited to leave their screens and technology behind. If you live in a city, you may also find that there isn’t a lot of green, outdoor space that’s safe for kids to enjoy. Planning a family camping trip is a great opportunity to show your kids a great time in nature, and to create memories that you’ll all share for years to come. Which isn’t to say that camping with kids is easy. It can take some hard work to put together a trip that everyone enjoys and wants to repeat again. Planning ahead and having a schedule of camping activities can make a big difference. 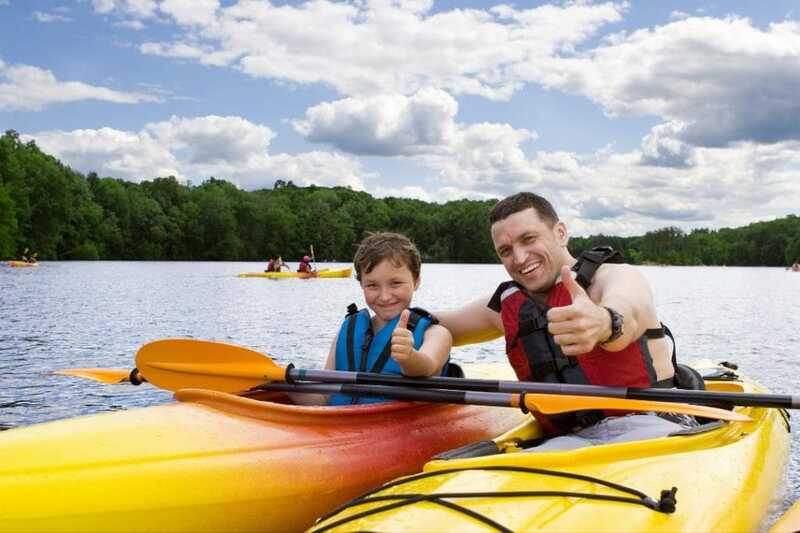 Below, we’ve put together some great activities for your family camping trip. Going for a hike is one of the most quintessential camping activities that you and your family can enjoy together. It’s a way to be active, get some exercise, and take in the beautiful nature of your surroundings. Before you get to your campsite, do some research on the best hikes in the surrounding area. You’ll want to find a hike that is an appropriate difficulty level so that everyone in your family can enjoy it together. Be sure to pack plenty of snacks for the trail too — hungry campers are not happy campers! Getting into nature and away from technology could be a hard sell for some kids. Older kids with smartphones or gaming devices might think they’ll be bored without technology close at hand. Change their mind by packing some classic board games and card games that you can play as a family. These types of games are more interactive for the whole group, and your kids may be surprised by how much fun they can have. After a hot day hiking, swimming, or being active, it can be nice to spend some quiet time together as a family. Being able to sit back and appreciate your beautiful surroundings is one of the greatest rewards of camping. Pack camping chairs to sit in, and blankets for spreading out a picnic. A car awning is a great option for creating some shade, and you can shop here to find one that works for your vehicle. If your campsite allows it, building a campfire is a great to end the day. You can work together to cook dinner over the open flames, roast marshmallows at the end of the night, and tell stories or share favorite moments from the day. There’s no better family gathering place, and as the night gets cold, a campfire will keep you and your kids warm and toasty. Collecting leaves, rocks, or other natural materials from your campsite could be the beginning of a cool scrapbook or collection for your kids. As you continue to go on family camping trips, they can collect different items from each place. Make sure you’re only taking things that have fallen naturally to the ground, and aren’t disturbing any preserved land or wildlife. Camping websites or signs can help you determine what’s okay to take and what should be left behind. Ready to Try Camping Activities with Your Family? If you want a fun weekend away with your family, camping is always a good choice. It lets you interact with nature in a way you don’t usually get to, and will the experience will lead to family memories that you’ll always treasure. For more information on fun family activities, please contact us at any time.